How do you create a mobile app that drives customer engagement? 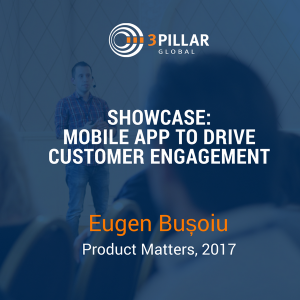 At the recent “Product Matters” event, 3Pillar’s Eugen Busoiu walked attendees through a mobile app that 3Pillar created for a luxury fitness club to show how to create and support an engaging mobile app. The “Product Matters” event was a product development-focused event held on September 7th in Iași, Romania as a part of the opening of 3Pillar’s new office there. Eugen talks about the how the development team centered their processes around the Product Mindset – which is the three tenets building for outcomes, excelling at change, and minimizing time to value – as well as understanding the business and clearly communicating ideas and strategies throughout their build. The team created a mobile app that now has over 2000 active monthly users, with users spending 400+ hours on the app daily. You can watch the full video of Eugen’s presentation below. Eugen is the first Engineering Manager from Iasi, the newest 3Pillar Global office from Romania. With more than 12 years of experience in product development and 5 years in delivery, Eugen is passionate about software engineering and new technologies. Previously, he held roles in software development and contributed to more than 20 projects on both web and mobile platforms. “Product Matters” was the first 3Pillar tech event in Iasi, Romania. The conference featured presentations on recent technology trends and understanding how teams work together to better manage a product’s lifecycle. Attendees were also taught the Product Mindset during the conference. If you like Eugen’s take, please help us spread the word about his talk! Hello everyone. Today I will be showcasing an app that one of our teams has developed for high-end luxury fitness clubs. Who is going to the gym? That’s great. Okay, a few things about me. I started my career in 2005 doing some freelance work for clients around Europe and Romania lesser. After that, in 2007, I joined a team of other five engineers to develop multiple web and mobile apps for the UK market. Most of our clients were football clubs. Then 2011 was the year of the challenges. I was learning Android by myself and accepted the new challenge as an Android Developer. One year later I was ramping up on a role that involved people and project management. Early 2017, by curiosity, I started being passionate about artificial intelligence, chat bots and machine learning, which led to the idea of building a community. You probably heard about Iași AI. Okay, great. Later this year, I joined 3Pillar as the first engineering manager from Iași, the newest office in Romania. It happened in June, end of June. Okay. Let’s see the high-end luxury fitness company. It’s called Equinox. It’s pretty big in the US. They have more than 17 clubs across US, one in London and a few in Canada. As you can see, this is how their clubs look. Besides comparing with other clubs, they pay attention to the details. That’s why they’re very successful. How we grew, in 2011 3Pillar started collaborating with Equinox with a team of two key engineers. This initial team grew up pretty quickly to an eight-member team. They introduced the testing automation and maintained it. Because the team understood the client’s business and successfully understood the processes as well, they started getting involved in other areas of the business. 2014, 35 engineers, multiple disciplines, digital platform, started working on the iOS app. Current year, 80-plus started working on the Android app in January, released it in May, the first version. Currently the team is working on 14 solutions for internal/external use. More, our teams are also helping the client with the brainstorming sessions, ideas, ideas that some of them are joining the product backlog or the roadmap. How we did that, by following a few ingredients, some of them are parts of the Product Mindset principles that David and Bogdan shared earlier: understanding the business, having clear communication, once we have those, get involved by providing ideas, improve processes if possible. All of this led to gaining the client’s trust. Once we had all this, we focused on delivering, repeating all the previous ones and, if possible, run the extra mile. This is the team. Here I will show you my experience once I joined 3Pillar. First day, it was a Thursday, June 28th, but started in Cluj, because the client was visiting us for one week and it was a great opportunity for me to meet the product team and the client. It was pretty interesting. For two days we had meetings, discussed the future plans, the current work. Those were very valuable discussions and helped me understand what are the challenges, what are the plans and so on. Let’s see the app. Let’s see some metrics. Currently the app has more than 2000 monthly active users. We increased the customer ratings from three stars average to four-plus. In August we had 700 new users daily. Users are spending 400-plus hours in the app daily, which is pretty big, taking in consideration the nature of the app. What are the main features that we have developed or are in progress? Club check-ins using the app. Their customers can use the app to check in when they enter the club. Just show the app with that barcode and that’s all. We have the check-ins activity. Besides the check-in, we also track calories, workouts, I don’t know, any activities that you’re doing in the gym. It’s fun that all these machines, some of them are connected. The effort, all the activity matrix that is calculating is pushed to the back-end server and delivered to the app. Of course you can view all the clubs because they have plenty of them with the schedule and the contact details. The purchase module that handles through Apple Pay, the daily pass, the personal trainer and the gift card. One of the most important features that we have is the class searching and booking where you can search, browse to the available classes, filter by trainer, by location, by date. Then you can book directly. For example, if you would book studio cycling it will also show you the actual plan of the room with all the bicycles and you can pick which one to book. Of course, health monitoring integration with Apple Health where you can, besides fetching the data from health kit as, I don’t know, sleep analysis, walking steps, distance and so on, it’s also adding what you are doing within the gym. My favorite, integrated chat bot as a personal assistant. This triggers when, for example, you have not used the app for a while. It triggers you, “Okay, what happened? Here are some recommendations that you could do in order to start”. Let’s say you have just finished a session, yoga or something, it asks you “How was the trainer? How was the session for you?” and so on. That’s pretty much it.